Q. My professor put materials on E-reserve for my class. How do I find them? If your professor has placed something on Reserve, check to see if it is an e-reserve or a print reserve. For print reserves refer to “How to find print reserves”. If it is an e-reserve, you will need to go through the Find Reserves page, and search by course name, course number, or instructor name. 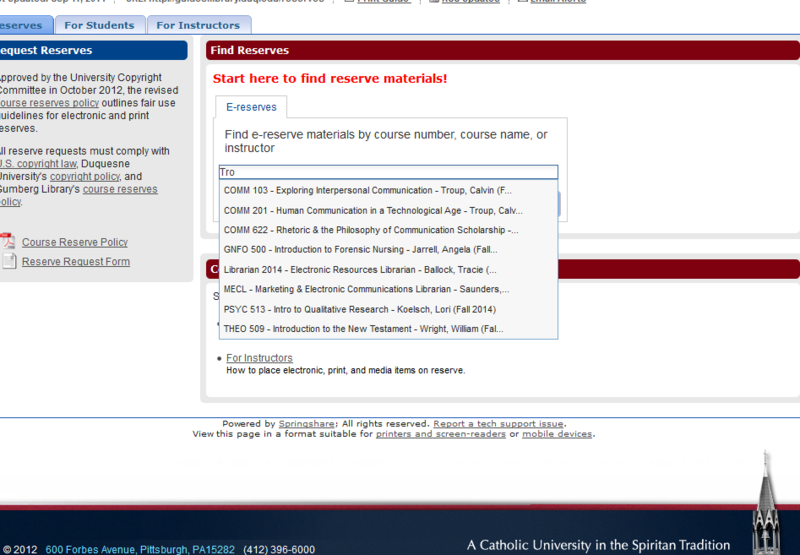 Note: when searching, you will need to select your course from the drop down menu. If you just click enter, your search will be negated and you will have to search again. Review the copyright disclaimer, and log in with the password given to you by your professor. If you have not been given a password, please contact your professor. Passwords for e-reserves are not kept on file at the library. Once logged in, you can access the course material from the list provided.